With a nod to the ancient Mesopotamians who built the first sailing boats some five thousand years ago, have you ever wondered what it takes to become a twenty-first-century sailmaker? We sat down with Charles Saville, Quantum’s Global Director of Customer Care and a third-generation sailmaker, to learn about this exciting and ever-evolving profession. Saville explains that the best way for aspiring sailmakers to begin is to apprentice in a loft – a sailmaking facility – for at least a year. During this time, apprentices will be exposed to most facets of sailmaking, from repairing existing sails to building new sails. After that, he advises developing sailmakers to spend some time in a dedicated service facility to develop their understanding of how to repair sails while also learning why sails are built in certain ways. 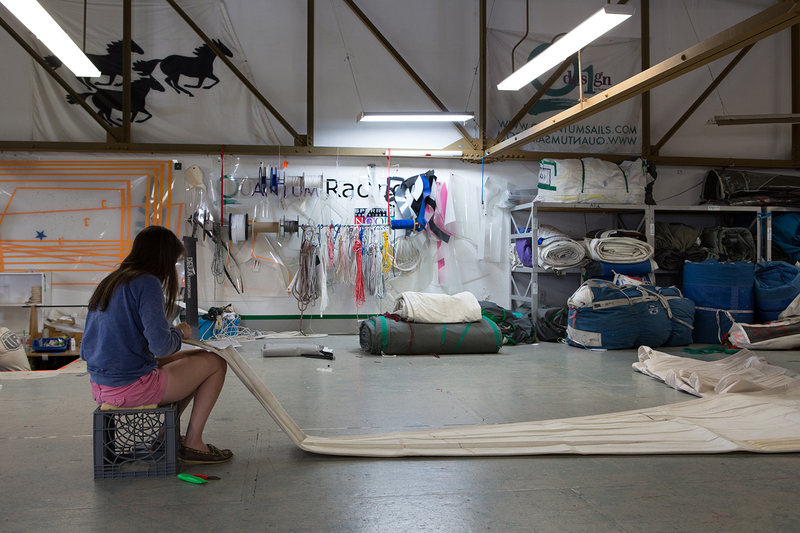 Service facilities offer the best opportunity for aspiring sailmakers to work on the greatest variety of sails, building their foundational understanding of sailmaking more quickly than if working in a production facility. Following this experience, apprentices are ready to delve into the intricacies of making sails in a production facility. If this sounds like a large investment of time and energy, that’s because it is. From traditional sails to cruising sails to racing sails to mega-yacht sails and more, sailmaking is vast and varied, and it takes time and dedication to learn all of the intricacies and skills required. Typically, sail designers have a background in Computer-Aided Design (CAD) and are highly educated in fluid/aero dynamics. It’s not essential for a sail designer to be born out of a technical background. Many successful designers learn the craft through their use of the product and love of the sport. These individuals are generally technically minded, with a drive to sail faster. They use the sails, think of ways to improve their performance, and then go back to the loft for recuts and tweaks. Over time, they develop the skills necessary to use the more powerful tools, like CAD and Q’s proprietary sail design software suite, to design sails. To this end, Quantum Sails employs Customer Care Representatives who are passionate about sailing and work closely with clients to ensure their needs are met and they have full access to all that Quantum has to offer. Professional, knowledgeable salespeople are equally critical to the success of Quantum Sails and any sailmaker. Not surprisingly, says Saville, many individuals on Quantum’s sales team learned the ropes of sailmaking through working on the loft floor. If this is a route you’re interested in, Saville recommends that you learn to build and fix sails and become technically proficient in the art of sailmaking while getting to know the wider sailing community. This ‘ground up’ training as a sailmaker is very powerful and has made our sales staff some of the most technically knowledgeable consultants in the industry and will benefit your career as well. The bottom line is clear, there are a variety of ways to turn your passion for sailing into a career. If you’re willing to put in the effort at the ground level to learn the art of sailmaking, the patience to stick with it to learn the craft inside and out and truly love sailing, you have the beginnings of a solid career path. As a growing company, Quantum is always on the look-out for great talent. Whether you’re ready for a career change or you’re fresh out of school, give us a call; we’ll be happy to talk with you about career possibilities in sailmaking and answer your questions. Click here to browse our current openings or get some ideas how you might apply your interests and talents.